This article is dedicated to helping my friends and fellow professional eaters that are seriously interested in winning more than just a few t-shirts, free meals, free trips, and a few extra hundred dollars here & there, and maybe even $1,000 or more a few times per year if the opportunities luckily become available. You may hear eaters brag about how much money they have won through competitive eating, but winning $40,000 over 1 or 2 years really isn’t to significant if he or she spent over $20,000 getting to all of the different events via travel & lodging expenses. More importantly, do you really believe that a top professional eater should ONLY make $40,000 per year?? Think whatever you want, but the only way to start making serious money is to start taking the sport seriously so that we can build a much larger fan base and community which will attract larger event hosts and sponsors. This not only holds true in the USA, but also the other major competitive eating countries such as the United Kingdom and Australia. 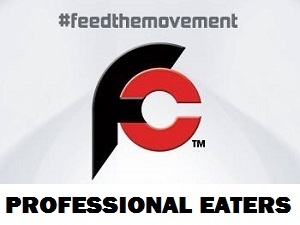 Whether you are a professional Major League Eater, All Pro Eater, or Independent (like me), you can still help us #FeedTheMovement and expand the entire eating community as a team which will create much larger opportunities for you, your friends, and everyone else that is involved. 1. Take our sport seriously – It is a fact that over 7.2 billion people around the world eat food, because they would die if they didn’t, and it is also a fact that people enjoy watching other people achieve things that they themselves cannot do. Think about it… how many videos, photos, and articles do you check out each week online and via television about people doing things that you couldn’t really imagine being able to do? As a professional eater, you are part of the foundation of our sport. Without you and the rest of us, competitive eating fans would have nobody to watch or follow, amateur eaters would have nobody to learn from or look to for motivation, Restaurants would have nobody to help promote their food challenges, most eating contests would be boring, and potential sponsors would have nobody to sponsor. Watching a person eat a lot of food is just like watching a race, fight, or other “different” activity than people are typically used to. Whether people agree with it or not, they will more than likely watch as long as they are not grossed out while watching. You don’t have to eat 10 pounds of food to impress people or gain their attention, because most people have never eaten over 3 pounds. At the end of the day though, there are 2 kinds of people… people who admit that they have overeaten at some point in their lives, and then there are liars. Millions of people would be interested in watching us, but first we must start taking our sport seriously so that we can give them a reason to actually watch us perform. 2. Begin building a “brand” – From an advertising and marketing standpoint, it is not how good you are at something that truly matters. Obviously that really helps, but the more important factor is how many people are following you and watching you do it, and the only real way to build a recognizable “following” in today’s world is through social media and branding yourself. You may be the best eater in the world, but a person can’t follow you if they don’t know your name or even what you look like. If you watch my YouTube videos or follow me, you know that I wear the same shirts with the same logos (which are my own) in every single video. Obviously, we don’t expect you to do the same thing, but know that it definitely helps. The most important thing though is that you give potential fans a place to go so that they can follow you. We will definitely help promote your personal FoodChallenges.com profile among members of the community, but know that it really helps to have a Facebook Fan Page, Twitter account, and even an Instagram account to post a few pictures every now and then of your eating accomplishments. You may even want to go that extra mile and create your own personal website too. Whatever options you choose, you can post the links on your FoodChallenges.com profile too so that people can follow you more easily without having to search too much. If you seriously want to be sponsored and make more money while doing something you really love (eating), then you need to begin establishing your own brand that fans can follow & support. To make real money, you need to get to a point where people are coming to events specifically to watch YOU and not just the event in general. Sponsors and advertisers always follow where the crowds are, so you should most definitely begin building your brand NOW. It is never too late to start!! 3. You will get back what you put in – Every person involved with eating is different with unique abilities and their own list of personal responsibilities. Whether you have a family or not, a “real job” with a set schedule or not, or whatever your case may be, just know that if you treat competitive eating like a fun & weird hobby, that is all it will ever be. If you are really into eating and good at it, the great news for you is that the “movement” is definitely going to happen whether people like it or not. As you read in What FoodChallenges.com Is Doing To #FeedTheMovement, we are doing a ton of different things to make the “movement” happen so that we can create a better atmosphere for all eaters, restaurants, promoters, fans, and sponsors whether they are directly part of the “movement” or not. Know that we will make sure that the people who contribute and help us the most will get well taken care of once opportunities start opening up. There is a long road ahead but our destination will be reached due to determination and everyone’s help. As you already know, the first people to the buffet get the best selection of food to choose from, so be sure to start taking advantage of FoodChallenges.com NOW. 4. #Hashtags – If you use Facebook, Twitter, and/or Instagram, you already know all about #hashtags. We were able to file a claim through Twitter successfully and now we own @foodchallenges. Our Instagram account is @foodchallengescom. We will be posting on all of our accounts each and every day to build our followers. We will have a #challengeoftheday, #videooftheday, and we will post articles and other things, including new updates about members of the community. We will also be reaching out to people using the #hashtags related to competitive eating. Our main ones will be #feedthemovement, #foodchallenges, and #foodchallenge, but we will also check for #competitiveeating, #eatingchallenges, and #eatingcontest. Involve these when you post pictures and updates so that people searching those hashtags will see your posts, our posts, and everyone else from the community using those #hashtags. If you mention us, we will be able to retweet and help promote your posts too. Make sure that you are following us, and make sure to let us know if we are not already following you. We will only be promoting members of our community, so those eaters and promoters with us from the start will be promoted most. The more often we use these highly searched hashtags, the faster the movement will grow!! 5. Use the resources on FoodChallenges.com – One of the easiest things you can do to help us and yourself is to use all of the applications and resources available through our website. We did not design the website with ourselves in mind, and we created it for everyone to use and benefit. We will only be promoting active members (everything is free) of the community so make sure that you have set up a legitimate profile to show off your eating achievements (challenge & contest wins). Make sure to also link your social media accounts and/or your personal website if you have one. Lastly, include links to your best YouTube videos if you have any so that people checking out your profile who don’t know you will be able to watch some of your events. We will use and cycle each video listed by our members as a #videooftheday via our daily social media posts. In addition to the social media platform, make sure to take advantage of the forums too. If you read a post from an amateur eater with questions, and you know the answer, then make a new post and answer it!! Helping others will not only help them, but it will also help you because other people will see your post and appreciate the fact that you are willing to take the time to help others who are still learning and wanting to improve. Your user profile is meant to serve as your “eating resume” that promoters and fans can follow, so let us know how we can improve it. 6. Put forth more effort to help promote small businesses – We need to start doing more things to promote the small restaurants and businesses that are hosting food challenges and contests. There are multiple restaurants with food challenges closing down each and every month. Restaurants which host yearly contests are also shutting down. In today’s world, it is EXTREMELY HARD for small businesses to compete with their larger competitors around them, so we need to help them first before promoting the large restaurants who don’t need or want our help in the first place. If you don’t already, video your challenges and contests, post pictures to your social media and tag the restaurants, recommend the restaurants to your friends via social media, and spend a few minutes writing a short review of your experience on Yelp, Urbanspoon, or TripAdvisor. McDonald’s, Burger King, Taco Bell, and Jack-In-The-Box won’t be corporately sponsoring any eating events soon, but a local restaurant may if they feel that people will take interest. Take that first step and help promote those small businesses around you. You will be more appreciated and there will be a much higher long-term payoff later. 7. CARE!! – That is such a short word but it is so powerful in the marketing world. If you don’t care and show that you are passionate about what you are doing, why would anyone else care to watch, follow, and support you? Whether you are signed with MLE, competing in All Pro Eating events, competing in independent contests, or strictly focused on winning food challenges, it doesn’t really matter, and we accept every positive person who wants to join the community. By showing passion and that you care, you are helping to #FeedTheMovement. Teach and inspire others, help promote the restaurants and festivals that you are competing at, and put forth sincere effort before, during, and after all of your events, and you will definitely like the future outcome. We will never forget “where we came from” and we also won’t forget the people who helped us get to where we are going. Help us get the “movement” started, and then once our community grows large enough, we will take it from there and start putting all of our goals into action so that we can begin creating better opportunities for everyone involved. Like I said, professional eaters are the foundation of our sport, so we need YOUR help to get things moving. Even if you do not become part of the community, you are still feeding the movement by your participation in eating competitions, simply because anybody that you inspire will get online and we will be the #1 and only website popping out at them. If you have questions or need help putting any of our recommendations into action, please don’t hesitate to contact us, especially if you have questions about the use of our website. * Please note that this is a pretty general article because we are aware that most professional eaters are teamed up with a particular organization already, and we are also well aware that we are not at the point now where we can start sponsoring eaters and events. Therefore, we don’t expect any MLE or All Pro eaters to quit and join us right now. These are significant points though that you should consider if you want to become a sponsored athlete of FoodChallenges.com once we begin to take over the eating scene after our community begins to really gain momentum and a few retirements occur. It’s not a matter of IF it will happen, but WHEN. Thanks for reading “How Professional Eaters Can #FeedTheMovement” & using FoodChallenges.com!! Find food challenges all over the world!! Search our entire article database!! Randy & Mitch’s Southeast USA Winter Tour + Hawaii!! FoodChallenges.com is a one stop shop for anybody considering attempting a local food challenge or entering the world of competitive eating. Find. Learn. Train. Connect. Conquer. The idea was first developed in 2010, and started out as just a dream. It is now a reality that is changing the entire sport of competitive eating and food challenges which will help millions of people. Learn more about the history along with the background of the owners that created it. Competitive eating and food challenges is generally called dangerous, gluttonous, wasteful, unhealthy, and promoting obesity. This ignorance stems from the fact that people have very little knowledge, awareness, and understanding of the sport. When people are ignorant, they are quick to criticize and judge the sport and the people involved with it. We are here to change that, and need your help!! Copyright © 2019 FoodChallenges.com All Rights Reserved.